Â I recently found myself with an apple overload in my kitchen. This rarely happens to me since I tend to go through apples very quickly (eating them plain, in pies, in crumbles, etc. ), so I decided to take advantage of the situation with a recipe that calls for quite a few apples: applesauce. Applesauce is one of those foods that is so easy to make, everyone should do it at least once. And even if you’re not a fan of applesauce in general, I guarantee that it will taste better when it’s homemade than when it’s storebought. Part of the reason for this is that you’ll have a sense of accomplishment that you won’t find on a trip to the grocery store, but the main reason is that it is incredibly easy to customize applesauce to your own personal taste preferences. For this batch, I used granny smith apples and fresh cranberries, and worked with guidelines I found here. Since both elements of the applesauce were on the tart side, I added a bit more sugar than I would have used for a sweeter apple to even out the flavor of the sauce. I also opted not to add any additional spices – cinnamon, allspice, nutmeg and cloves are all good additions to applesauce in general – to ensure that the cranberry flavor really shined. Rinse cranberries in a colander and pick out any mushy or unripe (whitish/light pink) berries. Fill a large saucepan with about 1 1/2 inches of water. Bring to a boil and add in cranberries. Cook until cranberries start to pop – about 5-10 minutes. Meanwhile, peel and core apples. Slice in half and slice each half into about 8 pieces. When cranberries are popping, add in apple slices. Cover and cook for about 15 minutes, until apples are very, veryÂ tender. Mix in sugar (you might want the full half cup if using Granny Smith apples, less if you are using sweeter apples) and salt. Turn off heat and mash mixture with a potato masher for chunky apple sauce, or use a food processor (or hand blender) for smooth. Makes approxÂ 1 1/2Â quarts. 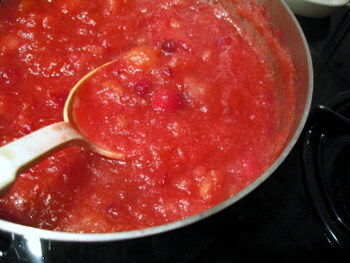 I have been making cranberry applesauce for years, and usually serve it on Thanksgiving. Sometimes I add a little cinnamon. It freezes well. I don’t bother peeling the apples – just send the cooled mess through my food mill. This looks great! I plan to make this this weekend! Yum, my friends mom always made homemade applesauce and it was the only way I’d eat it. She never added cranberries though, and I can’t wait to try this version. I tried to use cranberries in applesauce this fall, but found that the skins of the cranberries would curl up into weird little floaters. Any suggestions on how to fix that…tried to puree them into smaller bits, but just ended up straining the whole huge pot. I made this for Thanksgiving and it was delicious! Thanks.